EA021 model Two Wing Automatic Revolving Door has been designed for high capacity use. With the emphases on maximising the effect of glass it incorporates slim metal profiles and load bearing drum walls. EA022 model Two Wing Automatic Revolving Door has been designed for high capacity use. This model uses standard larger width metal profiles within its framework and these are available in many different finishes. EA052 model 3 and 4 Wing Revolving Doors have a centre rotating column design with larger drum diameters and therefore larger compartment sizes, it has been designed for busy building entrances with high people flow. 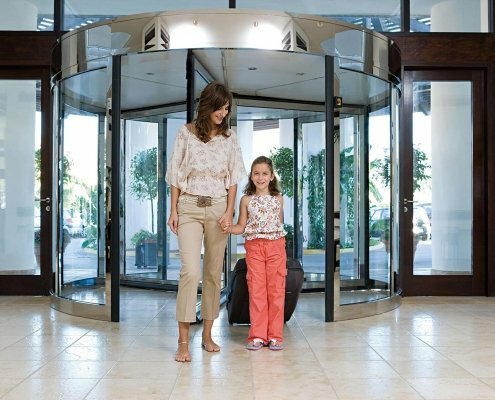 High capacity revolving doors are designed for buildings that experience large volumes of people flow in either a steady or peak time rush. Performance and functionality are all essential for the efficient operation of a building entrance, our high capacity two, three and four wing automatic revolving doors make for a practical solution for high volume and tidal pedestrian foot flow. 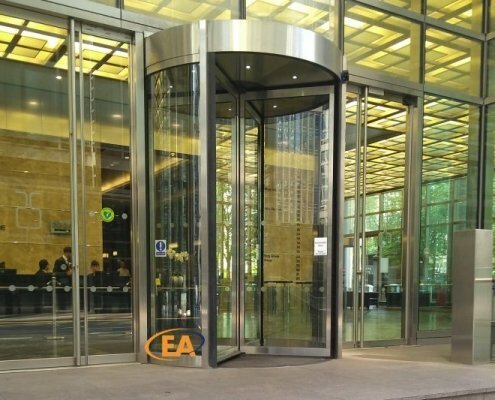 The EA052 model three and four wing high capacity doors offer an increased volume footfall of people than the standard framed revolving doors, and yet their prices generally sit between the framed revolving door and our two wing high capacity doors. Likewise, our EA021 and EA022 two wing high capacity doors offer even larger spacious people segments and combined with the smooth movement of the revolving wings, it gives this door an inviting salubrious appeal. 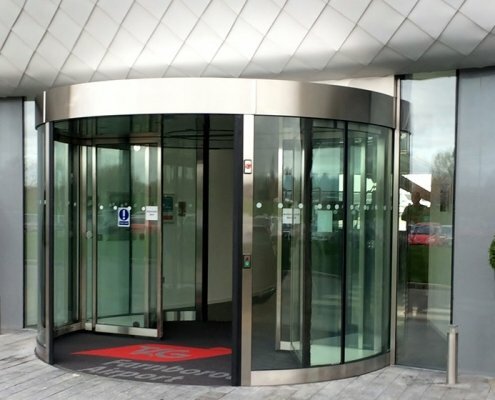 These types of high capacity revolving doors do not have a centre shaft, therefore affording more space in the segment compartments for wheelchairs, luggage trolleys etc, and the use of glass to reflect more natural light into the building. Furthermore we can offer our two wing high capacity revolving doors with a choice of either a dividing glass separation panel between the two compartments, or an optional centre sliding door, providing even more functionality and flexibility to an entrance. Even more for both slim or standard profiles we offer further choice configurations to suit the surroundings of all entrances. 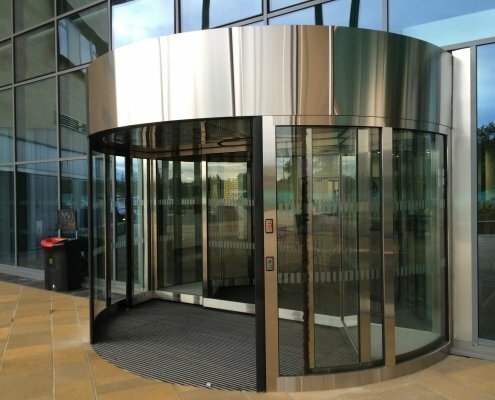 Similarly our two wing revolving doors are available in a choice of stainless steel (brushed or polished), brass or bronze finishes, PPC to any RAL colour or Anodised. Furthermore, we can even offer copper cladding as an additional optional finish. Our revolving doors can be installed directly to any finished floor surface or can be offered with a base ring to accept matting. All of our high capacity revolving doors reduce heating and/or cooling costs for a building, because these door types provide excellent environment separation from the internal and external elements. There are many reasons why our revolving door solutions are so popular. From the design outset the effective choice of quality materials and innovative automation solutions. Every revolving door is the work of highly-skilled staff. Each EA revolving door installation is carefully planned and installed by qualified craftsmen. 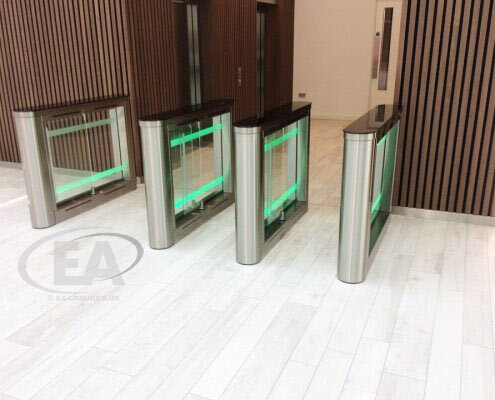 We supply, install and integrate inspiring Speed Gates with technology designed for access control and smooth people flowing entrance solutions. Our EA colleagues all share a passion for detail and innovative solutions. This commitment enables us to continually integrate new systems designed to give your Speed Gate projects the best possible secure solution – whilst giving your building the ultimate aesthetic appeal.